West Indies 139 (Chris Gayle 30, Kieron Pollard 28, Tim Southee 3-21) New Zealand 7-139 (Ross Taylor 62*, Brendon McCullum 22, Sunil Narine 3-20) West Indies won the match after Super Over. New Zealand proved unlucky twice in the ICC World Twenty20, as they lost the match to West Indies in the Super Over and were knocked out of the event. West Indies were bowled out for 139 runs while consuming 19.3 overs, New Zealand also managed the equal score after 20 overs and the match was Tied. Sunil Narine (West Indies) was declared ‘Player of the match’ for his excellent bowling spell in the game. The 21st match of the ICC World Twenty20 was played at Pallekele International Cricket Stadium, on Monday, October 1, 2012. Earlier, the Black Caps captain, Ross Taylor, won the toss and offered the batting to the Windies. Johnson Charles initiated the innings with a couple of fours in the first over, Chris Gayle hit a four on the second ball of the next over but the first was caught and bowled by Doug Bracewell for 8 three balls later. 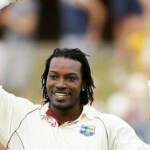 Gayle adopted his typical charge in the third over and dispatched 16 runs with the assistance of 1 six and 2 fours. The next batsman, Andre Russell, threatened the Kiwis with a six on the fourth delivery of the fourth over but was gone on the very next ball for 6 runs. Marlon Samuels joined in with Gayle and they added 17 runs in the sixth over with one six from each batsman. Chris Gayle lost his wicket for 30 of just 14 balls with 2 sixes and 3 fours. The next notable partnership of 26 runs was associated between Darren Bravo and Samuels. The first was caught by Tim Southee off Nathan McCullum for 24 off 22 balls with 1 six and 2 fours as the score reached 87. Bravo was clean bowled by McCullum for 16 as the wickets started crippling regularly. Kieron Pollard provided some resistance by scoring 28 off 22 comprising 3 fours as the entire Carribean side went back to the pavilion for 139 with three balls to spare. Doug Bracewell and Tim Southee were the main destructors with three wickets each, Nathan McCullum held two whereas Jacob Oram and Ronnie Hira shared one wicket each. New Zealand lost Rob Nicol early at eight runs when Martin Guptill and Brendon McCullum tried to make a rapid progress. They scored at least one boundary in each over and enhanced the score to 41 as the stumps of McCullum were uprooted by Samuel Badree for 22 runs. Ross Taylor walked in next but Martin Guptill was caught at point by Marlon Samuels off Darren Sammy for 21. The third wicket fell at 52 in 9 overs as Ross Taylor took over and played a dedicated innings. He scored 11 runs in the 12th over with 1 six and 1 four and repeated the same boundaries in the 16th over as the wickets kept on falling from the other end. Taylor achieved his fourth T20 fifty in the 19th over and remained unbeaten for 62 off 40 balls with 3 sixes and even fours. New Zealand scored exactly 139 runs for the loss of seven wickets at the end of the 20th over and the match entered the Super Over. Sunil Narine was the highest wicket taker with three whereas Ravi Rampaul, Samuel Badree and Darren Sammy claimed one wicket each. Result – match Tied – West Indies won the one over eliminator.